Right after Steve announced yesterday that iPhone OS 4.0 multitasking is going to be exclusive to iPhone 3GS and iPod Touch 3rd Gen., people started complaining. Steve said that due to hardware limitations these devices won't be able to support multitasking, but it turns out that some people have started looking into the OS beta and found out that, actually, it's possible to have multitasking on the iPhone 3G. Twitter user @cdevwill, the same guy who posted the screenshots of Cydia running on the iPad some days ago, has found out that by editing a single preference file, the N82AP.plist to be exact, you can set the multitasking value to "TRUE" and enjoy your new multitasking iPhone 3G. Of course, this implies that you have to have root access to your iPhone OS through jailbreak. 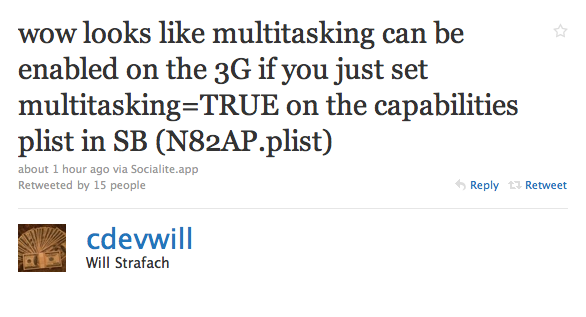 After all, we knew that multitasking is possible on the 3G, just because apps like ProSwitcher from Cydia work just fine on the 3G. It's good to know you'll be able to do it with the Apple's official method, anyway.